Idle is around 9W and maximum power consumption hits just under 17W in our test bed. That low power consumption is helped by the fact that there is no BMC onboard and no fans needed for the platform. On the other hand, the RAM, drives, and NICs use a considerable amount of power. Note these results were taken using 120V power, so 208V and higher may see lower power consumption. Thes chips are not released in a vacuum instead, they have competition on both the Intel and AMD sides. When you purchase a server and select a CPU, it is important to see the value of a platform versus its competitors. At $161, there is one thing one can be certain of: you are paying a premium for the performance this part offers. We did this benchmark piece to look at CPU performance, but realistically if you want the highest performance in this price range the Intel Core i3-8100 makes a better server processor. It also has more PCIe 3.0 lanes than its Atom counterpart. Compared to the Intel Atom C3000 series, one gets an Intel UHD Graphics 605 GPU with the J5005 which means it can support display outputs for digital signage. That includes 4K signage. 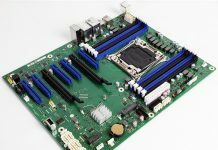 The Intel Atom C3000 series has significantly better I/O with available features like 10GbE, more PCIe and SATA III ports and only slightly higher TDP. We recently published our AMD Opteron X3421 Benchmarks and Review. The AMD Opteron trades more power consumption for better I/O, a lower cost, but similar performance. We think that for fanless applications, the Intel Pentium Silver J5005 is the better bet. If other factors are a constraint, AMD has a compelling product in this segment. When Fujitsu approached STH about reviewing its platform, we were initially worried that performance would suffer given a 10W TDP part. Instead what we found was a SoC that was able to perform well while offering complete silence. We wish that Intel included a bit more I/O as having the ability to handle a PCIe 3.0 x4 NVMe SSD, wireless networking, 1GbE networking, and four SATA drives would make this a category killer in the NAS segment. We also understand what Intel is doing with this product and think the execution on the product definition was done quite well. STH will have a review of the complete system soon.